We are happy to share the story of another amazing caregiver who has helped so many families over the years as a nurse and continues to do so as a volunteer with Willowbrook Hospice. 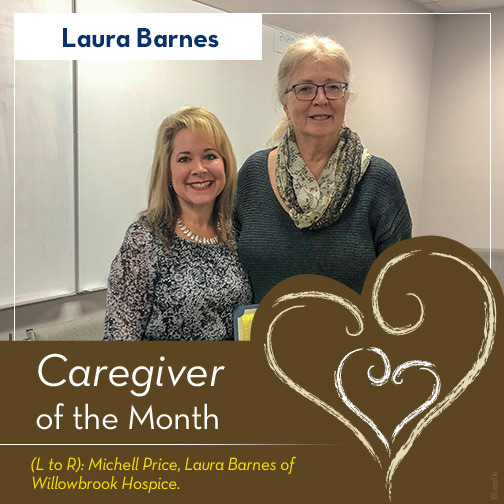 Congratulations to our Caregiver of the Month, Laura Barnes. Laura Barnes is a volunteer with Willowbrook Hospice after having served as a nurse for many years in different capacities. She has served as a volunteer with Willowbrook on two different occasions and does excellent work because she loves her patients and has a huge heart to help them during their time of greatest need. Laura also gives her all to the family, doing whatever is needed to help them, knowing that they are tired and exhausted from serving as caregivers for their loved ones during end-of-life situations. Laura always gets lots of accolades from the families because she loves on the patients and families and they need that during this time more than ever!